Uglyworld #653 - Turtle at Indian Beach, originally uploaded by www.bazpics.com. 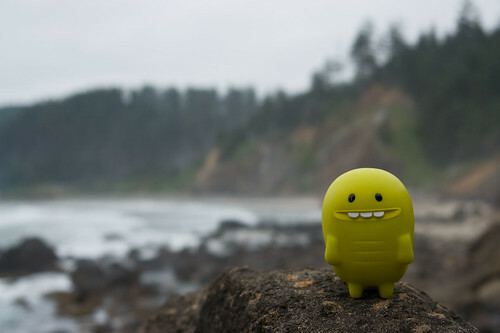 After all the shouting and screaming about Babo possibly being a vampire during his recent Inception episode, Turtle decided that it was best for him to stay in the hotel today as we were visiting Indian Beach which was used to film some scenes from the film Twilight. When Babo asked why he couldn't come Turtle replied, "You see's Babo, maybe you is or maybe you isn't a vampire, but we just can'ts take the chance, as you may ends up being possessed or somethings". Babo sadly had to agree with Turtle's logic.